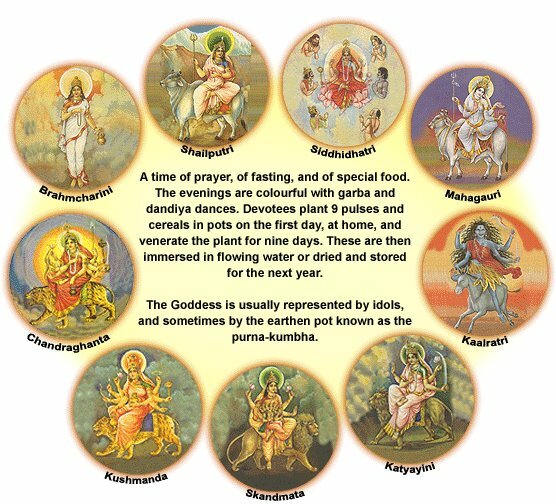 Below are some complilations on Navratri that may help you know the significance of this period. Namah Shivaya..
Navratri is a combination of two words. 'Nav' means nine while 'ratri' means night. Therefore, this celebration is literally translated as 'nine nights'. The celebrationsbegin on the first day of the month of Ashvin according to the Hindu calendar. They culminate in the festival of Dassera, on the tenth day of the month. As per the Gregorian calendar, Navratri always falls in the month of October. The exact date differs from year to year though. The festival of Dassera is celebrated to worship the goddess Durga. She is the embodiment of Devi, or the supreme goddess. The form of the goddess Durga is said to symbolize creative energy and the feminine body. This form of the goddess has nine aspects. Navratri therefore is dedicated to the worship of these aspects. Each form or aspect of the goddess has its own day dedicated to it. 4th — 6th days: These three days are devoted to the worship of Lakshmi, the goddess of prosperity and peace. Although these days are dedicated to Lakshmi,the goddess Saraswati is invoked on the fifth day. This day is referred to as Lalita Panchami. On this day, all the books and other literature are gathered in one place. Then, a 'diya' or lamp is lit in front of them to call upon the goddessSaraswati. 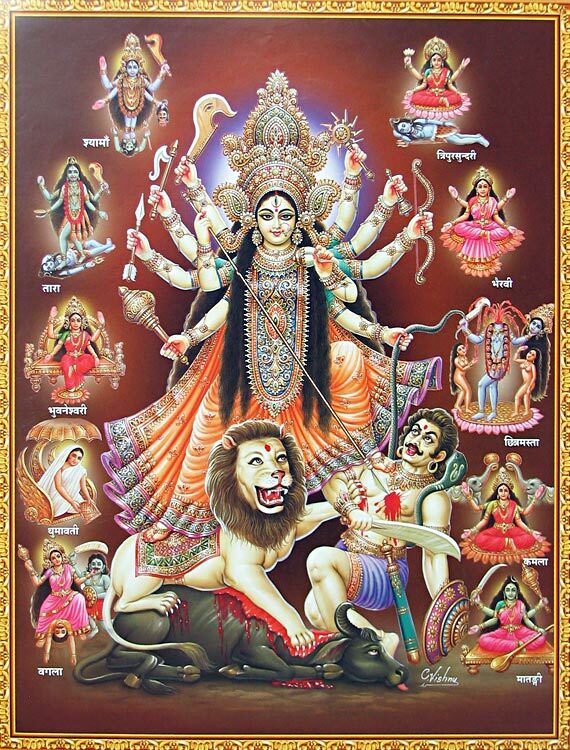 There are total nine forms of Goddess Durga which when taken together is called the Nav Durga. 1. Shailaputri - She is the first form of Maa Durga and the daughter of Himalaya. In previous birth she was the daughter of Daksha. Her name was Sati - Bhavani. i.e. the wife of Lord Shiva. 2. Brahmacharini - The second form of Goddess Durga is Brahamcharini. Here "Brahma" means "Tapa". The idol of this Goddess is very gorgeous. There is rosary in her right hand and Kamandal in left hand. She is full with merriment. 3. Chandraghanta - She is the third Shakti of Maa Durga. There is a half-circular moon in her forehead. She is charmful and bright. She is Golden color. She has three eyes and ten hands holding with ten types of swords - etc. weapons and arrows etc. She is seated on Lion and ready for going in war to fight the evil demons. 4. Kushmanda - The fourth Durga is Kushmanda. The Shakti creates egg, ie. Universe by mere laughing .She resides in solar systems. She shines brightly in all the ten directions like Sun. She has eight hands. Seven types of weapons are shining in her seven hands. Rosary is in her right hand. 5. Skandhamata - The fifth form of Durga is Skanda Mata. The daughter of Himalaya, after observing penance got married with Shiva. She had a son named "Skanda." Skanda is a leader of the army of Gods. Skanda Mata is a deity of fire. Skanda is seated in her lap. She has three eyes and four hands. She is white and seated on a lotus. 6. Kaatyayani - Katyayani is the sixth form of Maa Durga. The son of "Kat" as "Katya". Rishi Katyayan born in this "Katya" lineage. Katyayan had observed penance with a desire to get paramba as his daughter. As a result she took birth as a daughter of Katyayan. Therefore her name is "Katyayani" . She has three eyes and eight hands. These are eight types of weapons missiles in her seven hands. Her vehicle is Lion. 7. Kalaratri - This seventh Durga is black like night. Durga hairs are unlocked. She has put on necklaces shining like lightening. She has three eyes which are round like universe. Thousands of flames of fire come out while respiring from nose. She rides on Shava (dead body). There is sharp sword in her right hand. Her lower hand is in blessing mood. The burning torch (mashal) is in her left hand and her lower left hand is in fearless style, by which she makes her devotees fearless. 8. Mahagauri - The Eighth Durga is "Maha Gauri." She is as white as a conch, moon and Jasmine. She is of eight years old. Her clothes and ornaments are white and clean. She has three eyes. She rides on bull She has four hands. The above left hand is in "Fearless - Mudra" and lower left hand holds "Trishul." The above right hand has tambourine and lower right hand is in blessing style. She is calm and peaceful and exists in peaceful style. It is said that when the body of Gauri became dirty due to dust and earth while observing penance, Shiva makes it clean with the waters of Gangas. Then her body became bright like lightening. 9. Siddhiratri - The ninth and the final Durga is Siddhidatri. There are eight Siddhis , they are- Anima, Mahima, Garima, Laghima, Prapti, Prakamya, Iishitva & Vashitva. Maha Shakti gives all these Siddhies. This form of Durga is worshiped by all Gods, Rishis-Munis, Siddhas, Yogis, Sadhakas and devotees for attaining the best religious asset. During the first three days, the Goddess Mother is worshiped in her powerful, destructive and terrifying form of Kali/Durga. People pray to Mother, asking Her to use Her destructive power to destroy all imperfections and faults and purify them enough to become a receptacle of her divine energy. Self-Transformation: After Self-Purification, the next three days of Navaratri are devoted to worshipping the Goddess in Her prosperity-bestowing form as Mahalakshmi. Goddess Mahalakshmi does not merely bestow material prosperity, but also grants qualities which a sincere spiritual seeker requires, namely, calmness, peace, equanimity, compassion, and love. By worshipping and praying to Her, one starts developing positive attributes and experiences inner prosperity, peace and happiness. Self-Knowledge: During the last three days, Goddess Saraswati is worshiped as the bestower of the true light of knowledge, wisdom and understanding. Once one is purified by Goddess Durga (vices being annihilated), transformed by Goddess Mahalakshmi by receiving the spiritual wealth of inner peace, calmness, compassion and love, then the devotee is ready to receive the true light of understanding. By worshipping and praying to Goddess Saraswati, the devotee is now blessed with true wisdom (Self-Knowledge).